Untitled Goose Game delighted us all last year with a trailer promising to let us fulfill the most exciting gaming fantasy of all – the chance to be a very mean goose. It’s a little like Metal Gear, except instead of infiltrating terrorist strongholds, you’re sneaking around everyday people, snatching their stuff, and using it to engage in hijinks. 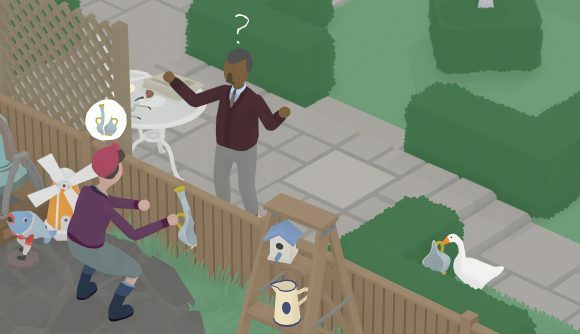 A new trailer for the game debuted today as part of Nintendo’s latest indie presentation, showing off a whole bunch of new scenarios where you turn pleasant days into unpleasant ones. Steal a gardener’s hat. Honk at children and chase them around. Drop a man’s clothes into a fountain to create a makeshift laundromat. Perhaps more pertinently, the trailer confirms an “early 2019” release for the game. That’s still too vague for my tastes, but at least it’s a bit more precise than the ‘sometime next year’ window we had earlier. It will be out for PC – on both Windows and Mac – along with the Switch release. The Metal Gear comparison is based on our hands-on time with the game back at GDC, and it’s just as delightfully nonsensical with controller in hand as the trailer suggests. It’s looking to be a very good time. Watch the new trailer for yourself here. One last detail of note – take a look at the screenshot above again. I mean, take a really good look at it. Yeah. What’s the deal with that little guy?